KTM WORLD has a massive KTM parts inventory in stock! Most orders ship the same day. 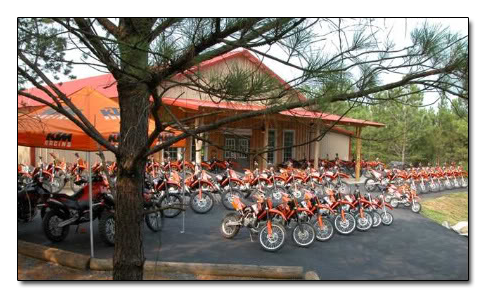 We are the largest KTM facility in the world, located at Highland Park Resort, a 1000 acre off-road riding park in the North Georgia mountains. KTM WORLD has a very knowledgeable staff to serve you. Open 7 days a week! Store hours are 9am - 5pm EST. Full KTM dealership with sales, service & parts. There are over 100 miles of trails, plus KTM rental bikes, camping cabins, 3 MX tracks, and a PeeWee track. Our staff is very experienced, we can answer your KTM questions and help you get what you need. We know what works! We typically have over 75 new and used KTM's ready for immediate delivery. Pick up your new bike and ride it right now at Highland Park Resort for a few hours - or all day - before heading home with your new KTM. Our service deptartment is KTM specialized, that's all we do. Husqvarna too now that they are a KTM product. Our KTM/WP suspension shop is the best in the country, with people shipping WP forks and shocks to us from all over the USA and beyond. We do lots and lots of testing with MX tracks and trails right out the back door, and have a suspension dyno to test forks and shocks. There is no place else in the world quite like KTM WORLD, and we look forward to handling all your KTM needs. Please let us know what we can do for you today!